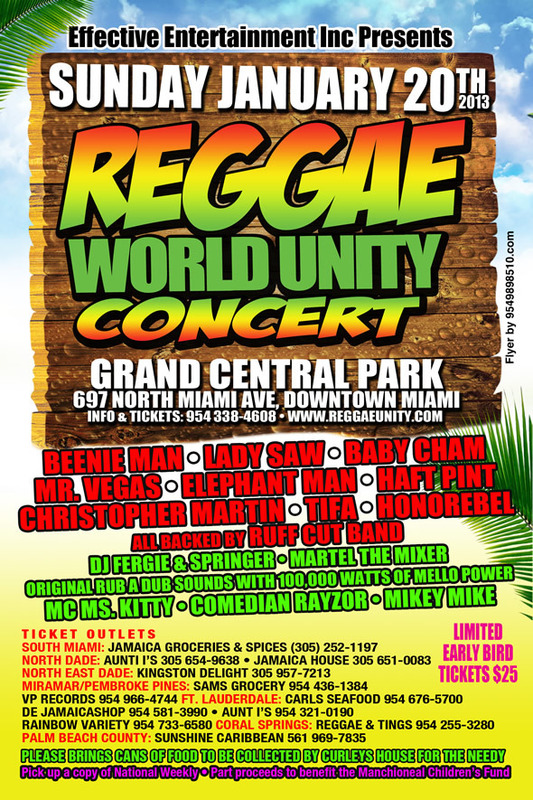 MIAMI – The Reggae power will captivate Miami and surrounding areas on Sunday January 20, 2013 when Effective Entertainment Inc. presents the first Reggae World Unity Concert at Grand Central Park (700 North Miami Avenue) Downtown Miami. This magnificent event will welcome the Doctor, Beenie Man, who has not graced the stage of the Magic City in over three years. The event also features the undisputed Queen of the Dancehall, Lady Saw, the Hit Maker Baby Cham, the Girls Choice, Mr. Vegas, the unpredictable Elephant Man, young crooner Christopher Martin, the exciting Honorebel, dancehall Princess, Tifa all backed by the award winning Ruff Cut band, and to top off this already unshakable line up we welcome Reggae legend Half Pint. MC’s will include the comical Ms. Kitty from Jamaica, plus comedian Razor from BET and Miami’s radio personality Mikey Mike. Martin Luther King weekend at the Grand Central Park (697 North Miami Avenue) Downtown Miami will be a day of Reggae/Dancehall jamming, food and music! What a combination! Vendors will be on hand to feed the massive, original jerk, escovitch fish, oxtail, roast corn, festival, sugar cane, all the mouthwatering goodies the Reggae culture has to offer. A limited supply of early bird tickets will be on sale for only $25 at local Caribbean outlets or on-line at www.ReggaeUnity.com VIP tickets are also available. The promoters are asking patrons to bring cans of food that will be collected by Curley’s House to be distributed to the needy. A special feature for the Reggae World Unity Concert will be the original dancehall sound system with a 21st century flavor. Mello Sound from out of West Palm Beach will be in its glory when he displays his 100,000 WATTS of Reggae power, Mellos 24 double eighteen speakers will recapture the sounds of the ghettos Kingston. Selectors, Martel the Mixer and up and coming DJ sensations, Fergie and Springer of Power 96 FM will contribute their flavor to the sounds of Rub-a-Dub. Folks this will be one for the record books, my suggestion to you is get your early bird ticket NOW.